Officers from Kings Norton Police Station have thanked Wigwam After School Club in Northfield for their festive donations supporting their Christmas Charity Hamper Appeal 2013. 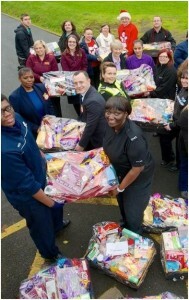 The appeal sees officers in Kings Norton delivering hampers to vulnerable families in the run up to Christmas. Local businesses and residents come together to make contributions and donations to the appeal, which is now in its eighth year. And thanks to their generosity the team was able to deliver 40 well stocked hampers on Sunday 22nd December. In addition they also purchased 16 duvets and duvet covers which were also delivered to the families. The hampers contained festive donations such as biscuits, tinned goods, hot chocolate, cereal and milk, as well as mince pies, Christmas puddings and toys. PC Marjorie Levy from Kings Norton Neighbourhood Policing Team said: “Many of the families who were selected have been victims of crime, anti social behaviour or domestic violence. All of the families have children, many being single parent families and three of the families have suffered the loss of a parent in the last three years. The families are known personally to officers from Kings Norton policing team and referrals have also been received from our partner agencies and local schools. “We have been genuinely touched by the support we have received from Wigwam After School Club, who’s contribution has ensured that 40 families had a safe and enjoyable festive period. Wigwam Holiday Club is run by Bright Kids Nurseries at Wychall Primary School, Middle Field Road, Northfield.